Would you like to learn more about Marine Biology and what is going on below the surface of our oceans? Through these weekly videos you'll learn about marine biodiversity and the inter-connectedness of ocean habitats. In this segment we'll investigate baitfish schools and their treatment of plankton, and then head over to my favourite habitats: black sandy slopes and rubble. From the critters living in and under the sand, to the beautiful bottom suckers that keep it clean, you'll meet some of the more whack species that natural selection has come up with—including perpetual faves the garden eels and the convict blennies. Click here to check out the previous videos from Josh. Planning a scuba trip? 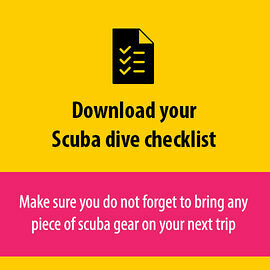 Then you should download the ultimate scuba dive checklist just like 5000+ other divers already so you will not forget to bring anything.